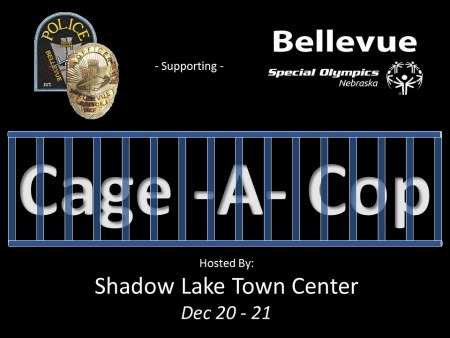 Help Release our Officer at "Cage a Cop"
On December 20th-21st the Special Olympics Nebraska Bellevue team will be holding a “Cage-A-Cop” fundraiser! Come out and support Officer Carl Grubb of the Bellevue Police Department as he is “caged” outdoors at Shadow Lake Towne Center weathering the elements…and the crowds. Help us raise his $5,000 bail to release him back into the community! All of the money raised goes to support the Special Olympics Nebraska Bellevue team via the Law Enforcement Torch Run. The Caging will begin December 20th at 9 a.m. in the center of Shadow Lake Towne Center on Maine Street near the amphitheater and will last until closing on December 21st – or until Officer Grubb posts “bail”. Mall patrons are asked to donate so that he can reach his goal of $5,000.